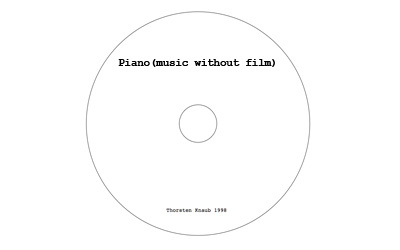 Piano (music without film) - some sound experiments to examine narrative through musical structures. The starting point of the working process was the layering and digitally sequencing of played keyboard sections to create moments the 'music' seems to resemble or evoke notions of a soundtrack. Subsequentely in other instances the 'music' then moves towards a more 'musical' structure and away from suggesting narrative. This shifting of emphasis was what I tried to explore.